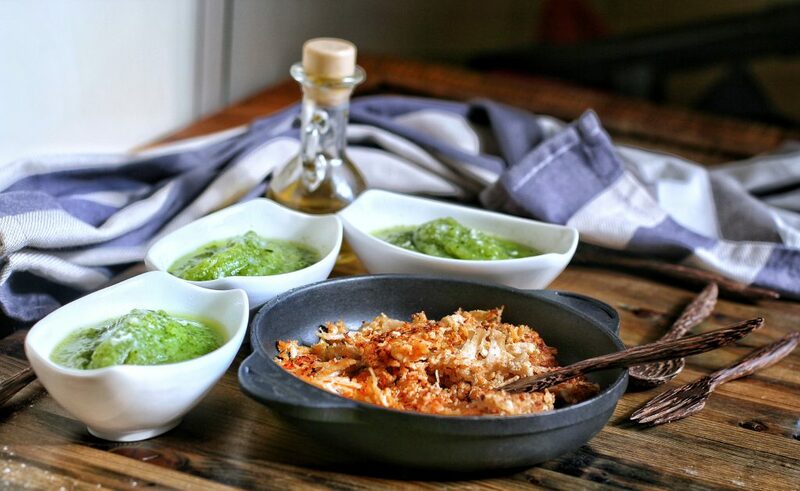 This healthy and low-cost recipe of the day is a true burst of flavour. It will tickle your taste-buds, I promise. 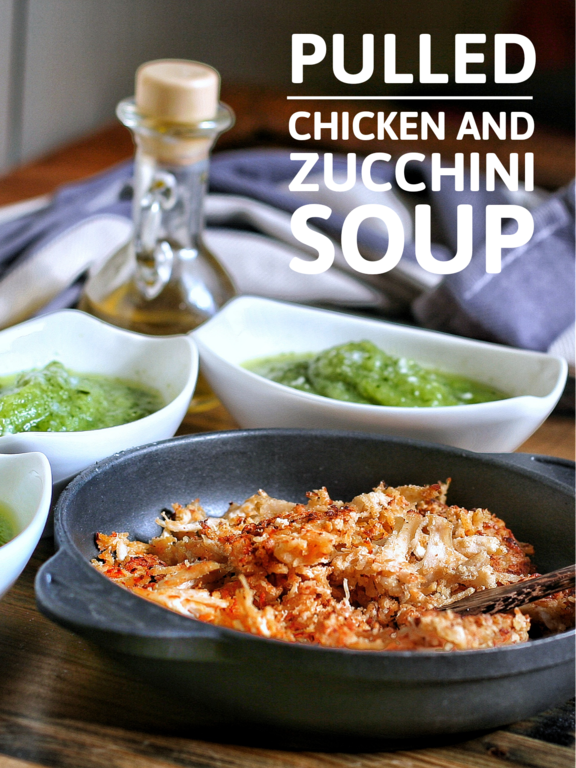 It’s a low-carb, high protein, pulled chicken with zucchini soup...ooops, I almost forgot…it’s ready in less than 30 minutes. Technically I’d better call it shredded roast chicken because it’s both shredded and roasted. I’ve just discovered that shred and pull are the same things, yes but. There’s always a “yes, I Know, but…”. It looks like that pulled refers to something pulled apart off the bone typical of dark and tender meat, even chicken drumsticks. Otherwise shredded refers to leaner meat such as chicken breasts, that are harder to separate. So you shred chicken white meat and pull, for instance, pork meat. That’s it! Even though it’s the same thing in the end. 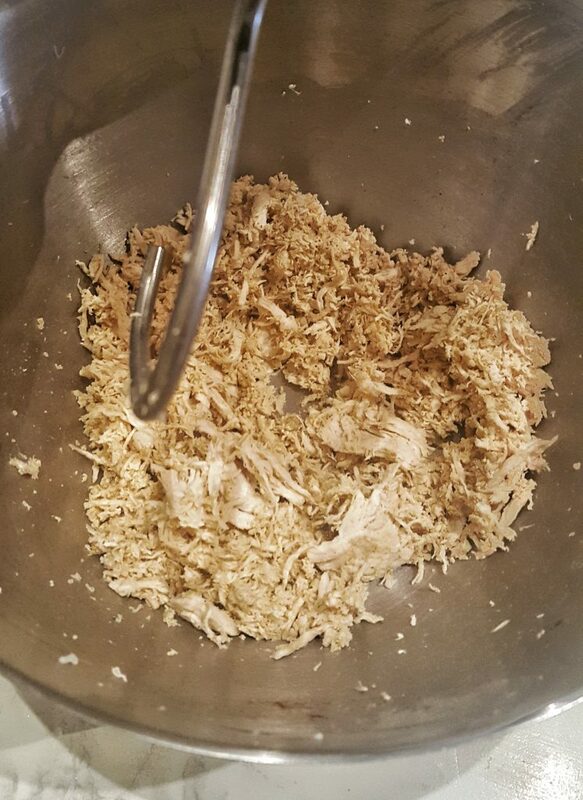 It seems like there is a super easy way to shred chicken and meat in general. I discovered it a while back and since then I’ve always made it this super easy way. I’m talking about a kitchen appliance we all probably have on a shelf somewhere. The underrated but always useful stand mixer. This may sound like a fun way to use this tool, but it’s a time saver, neat and perfect aid to have the job done in no time. No mess in the kitchen means less stress later. When I come back from the gym, after a long and exhausting session I’ve neither the time nor the inclination to cook for hours. No thanks. So, if I have some leftover cooked chicken in the fridge I shred it, meanwhile microwaving the zucchini in the MW steamer container. If I haven’t it ready to use I boil some chicken breast and then pull it apart with the stand mixer. It’s just a matter of time…that’s only a 15 minute difference. To make this dish, I spent a total of €2.86per single portion. Cheap, as always, and put together in less than 30 minutes! This 20|40|40 recipe is one of my favourite dinners throughout the year, no matter what phase I’m in…during cutting season it’s ok as it is, on bulking I just pair it with a bowl of rice or potatoes. 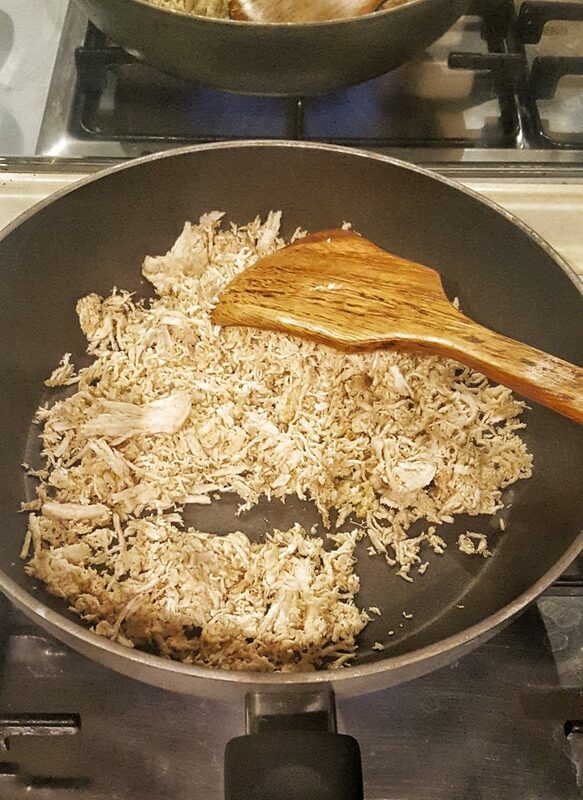 Lately, I’ve making pulled chicken once a week especially when I have a high protein meal set up for the day. Nevertheless, I am not complaining. If you want it higher in carbs I may suggest boiling some potatoes (the amount could be 1 to 2 potatoes but it’s your choice!) 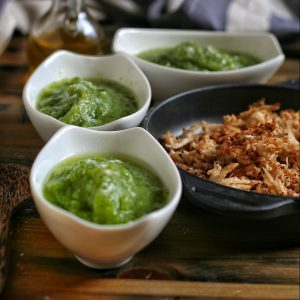 and blend them with the zucchini…it’s delicious, fluffy and tasty. 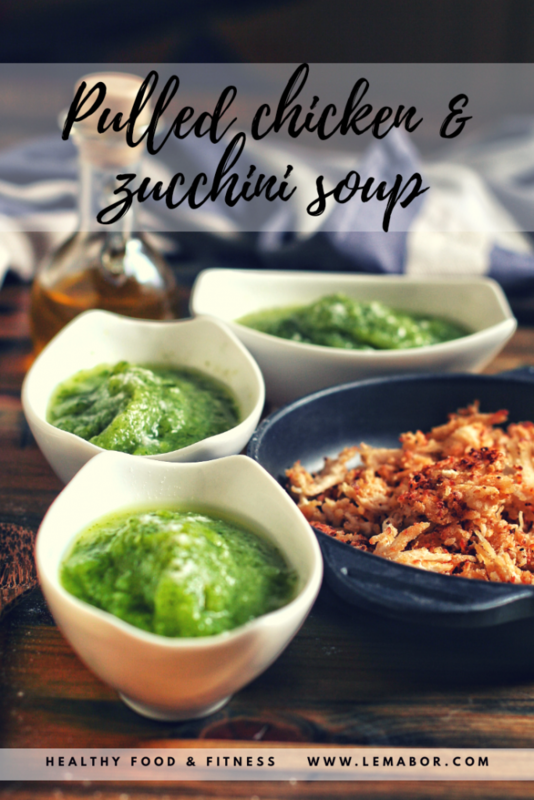 I find zucchini all year round, but they are a typical spring/summer vegetable. Here in Italy, we have a lot of variety, they come in funny shapes and different taste. I love the round ones…stuffed they are a classic. This recipe any kind is good. Don’t pay a fortune for something that has to be mashed or blended. Zucchini, just zucchini. If you want you can shred the chicken using two forks in the traditional way. Do you have some leftover cooked chicken breasts? Yes, I do ➡ rinse and trim the zucchini and put them in a steamer. I use the MW steamer container, it’s neat and quick. No, I don’t ➡ bring some water to boil and cook the chicken breasts along with the zucchini for 15 minutes till they’re done. 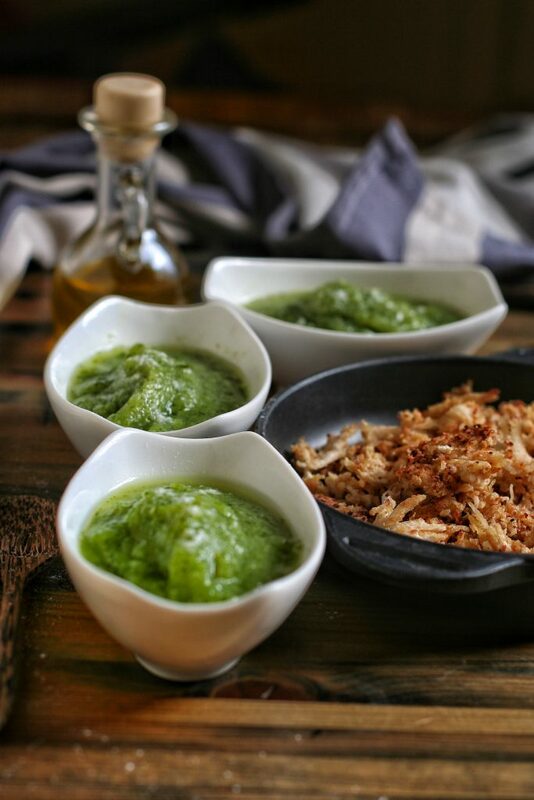 Blend the zucchini with a pinch of salt and pinch of paprika and set aside. on Low velocity, I use 1 or 2 . That’s because you want it shredded, not mashed 🙂 . Let it go until it riches the right “shrededness”. It took at least 3-4 minutes, but you decide the proper size of it. Add all the spices, salt and Worcester sauce. Grease a non-stick pan with an oiled cloth (I use a paper towel and a hint of olive oil) and heat it. Scrape the shreds off the stand bowl. Mix for 1 minute and add the rice flour and stir well. Pour in a ladle of water or broth and stir. Let it sizzle mixing continuously till golden and crisp. Be careful because it burns in a blink. Don’t use a high flame, low it’s better. Add the olive oil on top of the zucchini soup and that’s it. shreds to the soup in a big bowl. 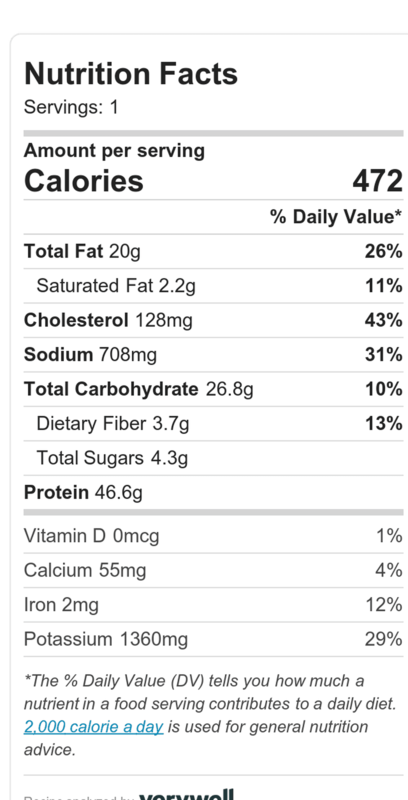 It gives that crunchiness I was looking for. Yes, I do: rinse and trim the zucchini and put them in a steamer. use the MW steamer container, it's neat and quick. No, I don't: bring some water to boil and cook the chicken breasts along with the zucchini for 15 minutes till they're done. Blend the zucchini with a pinch of salt and paprika and set aside. on Low velocity, I use 1 or 2 . That's because you want it shredded, not mashed :). Let it go until it riches the right "shrededness". It took at least 4 minutes, but you decide the proper size of it. Let it sizzle mixing continuously till golden and crisp.Be careful because it burns in a blink. Don't use a high flame, low it's better. Add the olive oil on top of the zucchini soup and that's it.